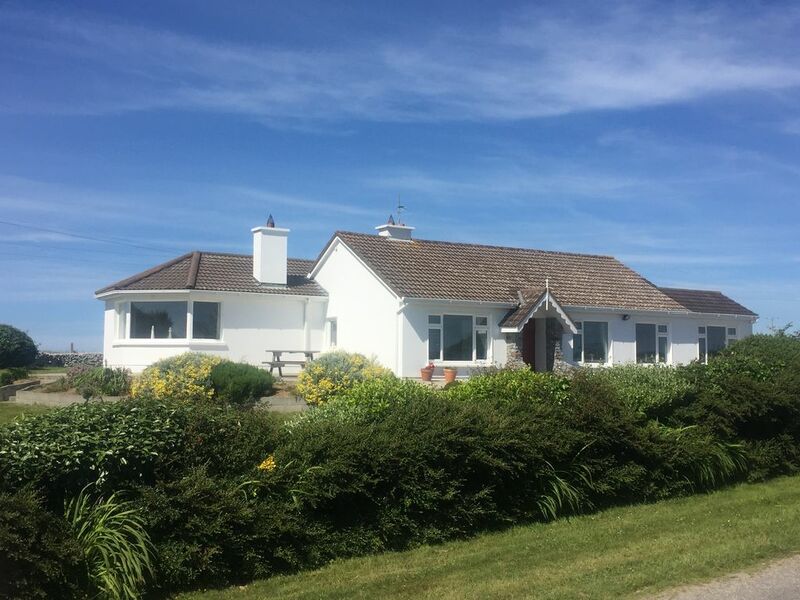 This charming and well maintained cottage is ideally situated a few minutes walk to the beach and close to walking, angling, sailing and golf clubs with spectacular views over Tralee Bay and the Sliabh Mish Mountains.This bright and spacious cottage can comfortably accommodate 6 people in two double bedrooms (one en-suite with walk in wardrobe) and one twin bedroom with separate bathroom. There is also an additional guest toilet. The open plan living/dining room is particularly large and comfortable and has been stylishly furnished but with comfort in mind. The picture window has panoramic views over the large enclosed private garden. There is Satellite television and a music system/DVD player in the living room along with a cosy open fireplace. The kitchen and additional dining area are fully equipped with all conveniences including a dishwasher. There is a separate utility room with washing machine and tumble dryer. For the children there is a playroom with games, toys and TV/DVD player. Active young family, love the outdoors, country air and sea. Love to surf, golf, sail and hike. Have a long affiliation with this very special location in Kerry. Full modern bathroom and separate shower cubicle. There is also an en-suite shower and toilet in the master bedroom and a 3rd Toilet in the utility area. There is also a 3rd toilet. A great place to stay along the Wild Atlantic Way! A true Irish experience! We rented Kieran's home in Barrow Ireland for two weeks in October 2018. His home was lovely and furnished with everything we needed....neat, clean, adorable. We were right near the Tralee Golf Links and enjoyed meals with a beautiful views...and we are not golfers. You can enjoy the restaurant without golfing. The home itself had beautiful views of Tralee Bay. It was exactly what we wanted...relaxing vacation with lots of beautiful southwest Ireland to go and see if you choose. Highly recommend this home. In Ireland for a family reunion and stayed at Lark Cottage. We are so glad we did. The house is nicely appointed. It had everything we could have wanted. The views...OMG!!! So beautiful. Incredible scenery out of very window. Since we were in for a reunion, we spent a lot of time in the Fenit area but it was also a five minute walk to the Tralee Golf Club. We didn't golf there but had a couple of meals which were very good. There is also a trail down to the beach through the golf course. We did this walk several times and usually only shared the massive beach with one or two others. Thanks so much to Kieran. He was very responsive to any questions that we had. We would definitely stay again..
We picked Lark Cottage because of the views and location, but got much more than we anticipated. “Close to golf & beach” means 3 minute walk to Tralee golf course; beach access is through the golf course! Views out the front window are across Tralee Bay to Dingle Penninsula and to Ardfert and beyond out the back. Interesting restaurants, each with different personalities, are within 10-15 minute drive. Activities are boundless, including hiking, horse trekking, horse races in season, and of course golf at Balleyheigue, Castlegregory nearby and others more distant. Lark Cottage is a comfortable place to plan the day’s excursions, relax and share memories at day’s end. Kieran and family have thought of everything from the welcome gift of a bottle of wine and apple tart to games, videos, music, books, and lots of brochures and guide books to all you need in the kitchen, outside in the yard, and in every room in the house. There are throws to snuggle while reading and wi-if to connect as needed. Unfortunately the weather was not good during our visit, but we watched storm Hector come on shore and learned to brave the Irish climate while still doing everything we planned and more. We found driving on the small country roads challenging, and had to add time into all our excursions to allow for getting off course. We decided to drive to Shannon the day before our flight home in order to make an early morning flight without driving at night. Thank you Kieran and family for sharing Lark Cottage with us. We take home many fond memories. We loved our stay at Lark Cottage. All modern, beautiful, comfortable and large, this home was conveniently located and only steps from a beautiful golf course and spectacular huge beach on which we were often alone. The owners are impeccably accessible and helpful. What a great find! Lovely to hear you enjoyed your stay. A very pleasant family who we hope will come and stay with us again. I can't say enough about our stay in Tralee! The cottage was beautiful, spacious, and came with stunning views. It was wonderfully located for day trips to Dingle, Cork, Cliffs of Moher, Ring of Kerry and many other attractions and at the end of the day provided a quiet place to relax. Thanks again Kieran and family for letting us your cottage!! There is so much to do in this beautiful scenic location. It is a great touring base to explore the Kingdom of Kerry but at the same time it is in such a lovely location you may not want to travel too far! As well as being surrounded by views of Tralee Bay, Brandon Head, the Sliabh Mish Mountains and Kerry Head you will be within walking distance of secluded Barrow beach which connects with Banna Beach which is renowned for it's surfing and beautiful Ballyheighue beach. Tralee Town is only 20 minutes drive away with all the amenities you would expect from a bustling market town. For indoor activities you can choose from the Kerry County Museum, The Aqua Dome for water slides and a cinema to name a few. At the cottage you will also overlook Tralee Golf Club which was designed by Arnold Palmer. The are several other golf clubs within the area and Ballybunion and Killarney Golf Courses are within 30 minutes drive. There are a number of traditional and seafood pubs and restaurants in the locality and Tralee Golf Course serves meals all day if you fancy breakfast overlooking the 1st tee. Fenit Harbour is less than 15 minutes drive and has a popular Marina and relaxed atmosphere. The Sailing School in particular is very active during the summer season. Sea Angling is accessible through this port and River Fishing on the River Feale is available in Listowel approximately 30 minutes drive away. Rates include heating and lighting, linen and towels including beach towels. Free Broadband and Wifi. Housekeeping provided at the end of your stay. Additional Housekeeping may be requested and is payable directly to our Housekeeper. Babysitting services on request and also payable directly to the Babysitter.